Welcome to The Salvation Army USA Eastern Territory site. The Salvation Army USA Eastern Territory includes the states of Connecticut, Delaware, Maine, Massachusetts, New Hampshire, New Jersey, New York, Ohio, Pennsylvania, Rhode Island, Vermont, and certain counties in Kentucky. Puerto Rico and the Virgin Islands are also included within this territory. 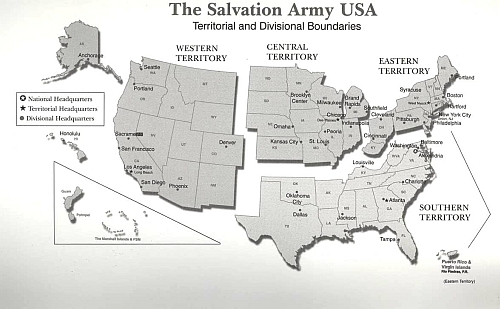 Three other Salvation Army USA Territories serve the Western, Central, and Southern regions of the country. All territories are supervised by The Salvation Army National Headquarters in Alexandria, Virginia. Our Eastern Territorial Headquarters is located in West Nyack, NY, and operates under the leadership of Commissioner Lawrence R. Moretz. This administrative headquarters oversees all operations and programs for service-providing units of The Salvation Army within the Eastern Territory. To effectively minister and serve within such a vast area, the Eastern Territory is divided into 11 Divisions, each headed by a divisional commander. Divisions are comprised of corps community centers (Salvation Army churches) and other specialized service centers. Corps community centers are the most basic service units of The Salvation Army, providing religious and social services adapted to the needs of their communities. There are over 400 corps community centers within the Eastern Territory. Areas that are without an official corps community center may be served through The Salvation Army's service extension units. There are presently 1,454 service extension units providing assistance to more remote regions of the Eastern Territory. 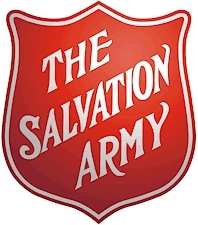 In addition to corps community centers and service extension units, there are also approximately 300 Salvation Army Thrift (or Family) Stores. The proceeds from all of our thrift stores support more than 40 adult rehabilitation centers within the Eastern Territory.